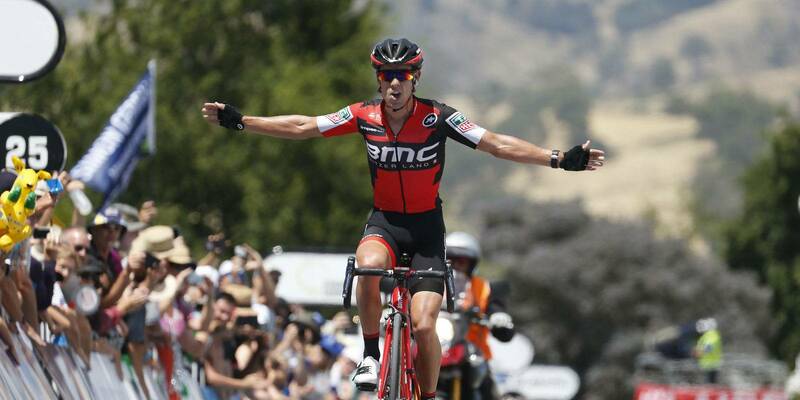 Richie Porte’s big moment has finally come. Winning on the Willunga climb for the fourth straight year at the Tour Down Under, Porte secured an overall win in what is considered the first main tour of the 2017 professional cycling season. Porte, the Australian rider that had conquered this climb before but fallen short of the leaders’ Ochre Jersey, was brought across the line by a rowdy home crowd celebrating the occasion on this fifth stage out of six. For the second straight day, a breakaway featuring Quick-Step Floors’ Jack Bauer gave the main field all they could handle, eventually being caught by a peloton driven by Orica–Scott and Team Sky at the base of the final climb. Team BMC once again set the pace when they needed to prior to that point, as Rohan Dennis happily delivered Porte to Willunga – where he unleashed an attack to leave his podium contenders behind. Johan Esteban Chaves moved from third overall to second on this stage, finishing 48 seconds behind the leader Porte. It has been a long time coming for Richie Porte to earn this spotlight, who proclaimed before the stage that offense would be his best defense today. Backing this talk up is entirely different though, and he did just that for the fourth year in a row and first in the Ochre Jersey. Now established as the leader of a deep and talented BMC squad, Richie Porte could not have asked for a better start to what was an exciting 2017 Tour Down Under. As he said immediately after the race, his focus will be on competing for the yellow jersey in the greatest bike rice in the world – the Tour De Frace – this July. To do so, he will have to be able to go on attacks similar to the confident one he did today, fully earning the right to parade the leaders’ orange jersey tomorrow in this tour’s final stage at Adelaide – which will belong once again to the sprinters.